ASEAN+3 Bond Market Guide is a comprehensive explanation of the region�s bond markets. It provides information such as the history, legal and regulatory framework, specific characteristics of the market, trading and transaction (including settlement systems), and other relevant information. 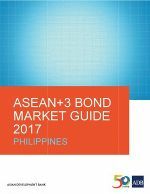 The Bond Market Guide 2017 for the Philippines is an outcome of the support and contributions of ASEAN+3 Bond Market Forum members and experts, particularly from the Philippines. The local currency (LCY) bond market of the Philippines expanded 5.3% quarter-on-quarter and 11.4% year-on-year in the fourth quarter of 2018 supported by increases in LCY government and corporate bonds. Outstanding LCY bonds amounted to PHP6,098 billion (USD116 billion), up from PHP5,792 billion in the previous quarter. Issuances of LCY corporate bonds in the fourth quarter of 2018 totaled PHP130.9 billion, increasing more than 150% from the previous quarter. Banks increased their issuance of bonds as an alternative funding source after the Bangko Sentral ng Pilipinas relaxed its rules to allow banks to tap the domestic capital market without prior approval from the central bank.